The other day a good friend of mine said she hadn’t seen any new posts lately; I didn’t even know she read my blog. I knew I hadn’t posted recently; my heart hasn’t really been in it since ʻUkulele died. I’ve been having little glimmerings of wanting to update my blog again, and my friend’s words gave me the impetus to begin again. Several weeks after ʻUkie died, I was so lonely! She always tucked herself next to me to sleep, and purred that amazingly loud purr till we both fell asleep. Now, there was silence. There was usually no one to greet me when I came home, no one but Nolemana clamoring for food, no little meows, no one on my lap when I watched TV. And I missed that. Feeling a little guilty, I began looking online at different shelters to see what kitties were available. But I felt so disloyal! Then some friends on Ravelry helped me to see that I wouldn’t be disloyal to get another cat, and that really, I’d be giving a needy cat a home, thus spreading ʻUkie’s love to someone new. That really helped. I knew there was no way to replace her…I was just going to make more room in my heart for a cat that needed a home. After all, who wants to spend a lifetime in a 2′ X 2′ kennel? I saw some cats that looked promising; I even drove over an hour away to see some. In the first shelter I went to I fell in love with a lovely calico, but she’d already been spoken for. But I guess my heart just wasn’t ready, and I came home empty-handed. I went back to that same shelter several times with the same result. Then I visited another shelter, and yet another. My friends on Ravelry assured me that I would know when I found the right cat. They couldn’t really explain how I’d know, just that I would. And I think up till then I was looking for a calico like ʻUkie and I realized that it might be better not to. By this time, several weeks had passed. I think I’d gone to about five different shelters, spent hours on the road, and sure learned a lot about how shelters are run. I decided to stick with the first one I’d gone to (the one that’s an hour away) and just wait till the right cat showed up. But then I found a link to another one across the river in Vancouver, and saw a face that captivated me. Keep in mind that I had no interest in a male cat, or a black and white one. I wanted a girl kitty. But I kept coming back to this face! 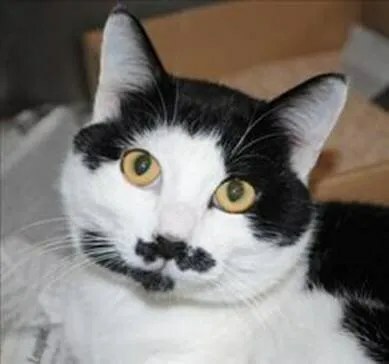 He was just so cute with that mustache of his! But wait. I wanted a girl kitty. 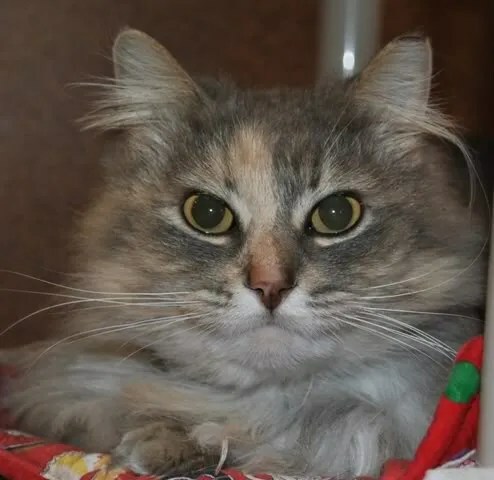 I looked around on the website and saw another kitty I might be interested in. A girl. Now try look her face! How sweet is that! Well, I couldn’t decide. I didn’t know what to do. So I just decided I’d drive across the river and just take a look. Continued next time. What will Mokihana do? Did she get a kitty? Was the cat carrier empty when she got home? Stay tuned. I would have had a hard time choosing between these two kitties. My bet is that you got both of them. I agree wit Kim. I would have took both home. Das why I don’t go to the shelters here. I am afraid I would come home with more than one cat and dog that needs a home badly. Tune ’til next week to see how long Moki can keep us in suspense. I stumbled on your blog bc you helped out a person with cable issues and I saw your avatar. I live in Lihue on Kauai and I thought “Look! Local! !” I was glad to come to your blog. This was the first post i read. I am sorry about your cat. It is hard to loose a dear friend wether they have 2 feet or 4. I hope you brought home both cats. You deserve to love them both and they should have a kind heart like yours! My guess is you adopted both of them (it is what I would have done). My beloved Buddha kitty has been sort of diagnosed with a nasal tumor. She is still active and happy, but she is also 15 years old. Our other two cats are 15 and 12 years old respectively. It is a hard time coming, but they have given us so very much love! I know they will want us to pass it on, when the time comes. Wish I coulda send you one my babies… dey so lovin. But glad to see you findin anuddah baby to care foa. Da kitties love wen somwun new come home… dey not wantin you to be sad. I tink one’a my yard kitties is reincarnation of kitty I had foa 22 years… jas de way she look at me, cuddle wit me an givin me a bath… exactly da same. So I feel dey all come back to us in time, jas in a different body. Hugs and love to you both (haven’t read next blog, so not suah how many you got).